If you're looking for a central location, look no further! 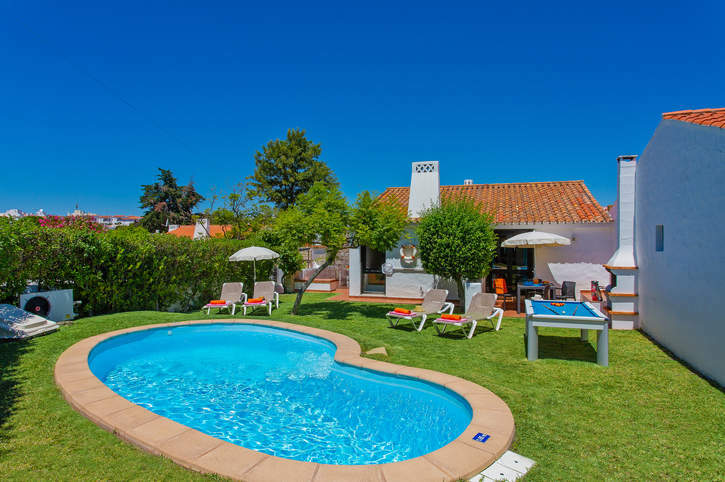 Villa Sueste is a pleasant bungalow style villa just a stone's throw from shops, bars, restaurants on the lively Praia D'Oura Strip. The expansive sandy beach is also within a 5 minute walk. Should you wish to explore further, Albufeira is under 2 miles away. This 2 bedroom villa has ample garden space surrounding the private pool with pool heating, WiFi and air conditioning/heating in all bedrooms included. Being so close to Praia D'Oura Strip and a beautiful sandy beach is fantastic - Villa Sueste is a perfect holiday choice! Outside, Villa Sueste has ample garden space surrounding the private swimming pool, which is dotted with sun loungers.To one side of the villa is a wooden beamed pergola over the exterior table and chairs. On the opposite side is the pool table and a brick BBQ - perfect for alfresco dining. Even though a car is not required, there is an off road parking bay should you choose to hire one. There are 2 steps leading to the villa's front door. The lounge, dining area and kitchenette are all open plan. In the lounge area you will find ample seating centred around feature fireplace and TV. From here, patio doors lead out to the exterior dining terrace and pool. The kitchenette is equipped with all modern appliances and there is a dining table with chairs next to it. There are 2 twin bedrooms and a separate bathroom in the villa. Both bedrooms have built in wardrobes and patio doors, one with access to the side of the villa and the other to a small private terrace leading through to the garden/pool area. This villa has applied for a licence and the submission number is AlojLocal/2009/46. The licence number will follow. Villa Sueste is situated in a cul-de-sac on the urbanisation of Jacaranda Villas in Praia D'Oura. The resort's famous Strip with a large number of shops, restaurants, bars, nightclubs and an expansive sandy beach are all within a 5 minute walk from the villa. Praia D'Oura is perfect for anyone wanting a lively atmosphere! The popular resort of Albufeira is also 5 minutes away by car. Villa Sueste is on the same road as our villas Sunshine and Levante. Villa Sueste is a semi-detached villa positioned in a central location. It is just a short walk from shops, bars, restaurants and nightlife the famous Praia D'Oura Strip has to offer. During the day you can enjoy a bit of retail therapy and lunch at any one of the numerous cafes and restaurants. At night Praia D'Oura really comes to life, with many of the bars and clubs offering a great atmosphere - open until the early hours in a high season. A varied choice of live music can also be found here. In Albufeira there are wide shopping streets and restaurants particularly in the square with occasional live music contributing to this lively holiday resort. The closest beach to Villa Sueste is Praia D'Oura, which runs adjacent to the Strip and has water sport facilities plus a choice of beachside cafes and restaurants. For more relaxing surroundings, a string of picturesque cove beaches can be found just to the west of Albufeira, such as Coelho, Castelo and Galé. A little further afield about 20 minutes' drive from Albufeira, are the sandy stretches of Praia Grande to the west and Falesia to the east. A good choice of water-slide parks and the Zoomarine aquarium as well as dolphin show are within a short drive. The older part of Albufeira is ideal to get a taste of the past with narrow, cobbled streets, handcraft shops and sand art down on the beach. The marina in Albufeira is surrounded by colourful houses and has a number of bars, restaurants and activities to suit everyone. For the more adventurous, the marina offers everything from windsurfing to scuba diving, parasailing to dolphin safaris! You can also hire a boat and take a tour of the beautiful Portuguese coastline. For golfers, the 9-hole Sheraton Pine Cliffs course is nearby at Olhos de Agua, with five 18-hole golf courses 25 minutes away by car at stylish Vilamoura. Guia is a small village in The Algarve about 3 miles inland from Albufeira. The narrow streets and old-style cottages are reminders of Portugal in times gone by. Gaia is also known as the chicken Piri Piri (a traditional spiced chicken dish) capital of The Algarve! Villa Sueste is not available to book for season as it is sold out. Take a look here at the Algarve villas that are currently on sale. Lovely villa and lovely holiday!